I love to make this zucchini frittata when I have an abundance of summer vegetables on hand. Serve it for an easy, delicious brunch or dinner! The frittata is one of my favorite things to throw together because, really, anything you need to use up can go into a frittata. Last week, I had a variety of tomatoes, zucchini, and some really lovely sweet potato greens on hand, so I made this simple zucchini frittata. Use this recipe as a guide to use up whatever you happen to have in your refrigerator – for example, spinach or kale would be easy substitutes for the sweet potato greens. This Zucchini Frittata is Healthy! A while back, I used to shy away from frittatas because I thought they required lots of butter and cream. (I used to be entirely non-dairy). While I do eat small amounts of high quality cheese pretty often these days, I still don’t do milk. Turns out, you need neither cream nor butter to make a delicious frittata. I use olive oil here, and since almond milk is what I keep on hand, almond milk is what goes into my frittata. It works perfectly to make the eggs nice and fluffy. 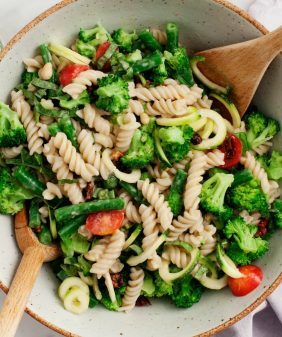 As I said before, I loaded this recipe with veggies, which makes for a flavor and nutrient-packed meal. I highly encourage you to do the same, though you might not be able to find sweet potato greens. If you do see them at your local farmers market – grab them. They’re so soft and delicious – like spinach but with a milder flavor. 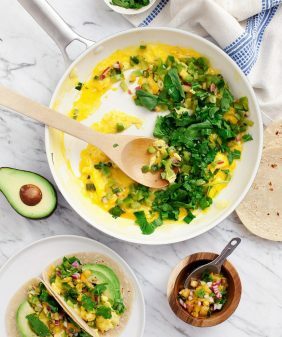 So pile in the veggies and serve this for brunch, or better yet – breakfast for dinner! 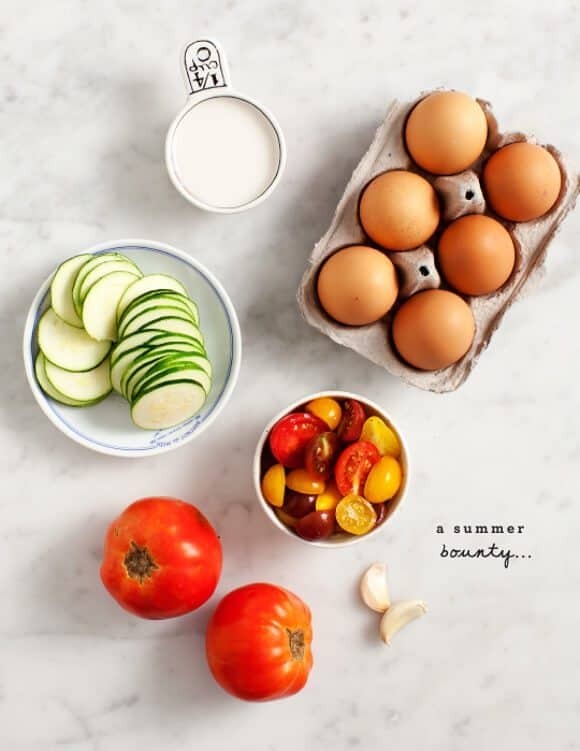 For more frittata ideas, check out this post, or for more zucchini recipes, try my zucchini bread, baked zucchini, or zucchini lasagna! Serve this healthy zucchini frittata for a delicious summer brunch! I used sweet potato greens in this recipe, but if you're not able to find them, spinach or chard would be good substitutes. Heat an 8 or 10 inch skillet on the stove. Add a bit of olive oil, then add the chopped greens, zucchini, minced garlic, and a few pinches of salt and pepper. Cook for just a minute or so - until the greens wilt and the zucchini starts to soften. Add a pinch of paprika, stir, then add the eggs. During the last 5-ish minutes of cooking time add sage and thyme on top. (If you're using basil, add it just as the frittata comes out of the oven). 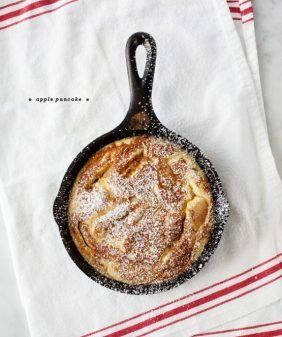 If you're using a skillet larger than 10 inches, use 8 eggs instead of 6. Totally – frittatas are where it’s at. 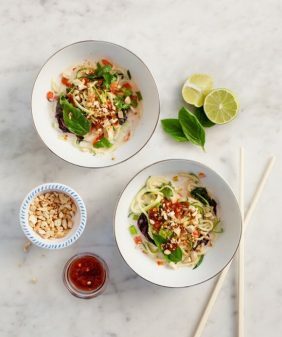 They are the perfect weeknight meal! So beautiful! And I’ve never eaten sweet potato greens before. I’ll have to try them out! I just LOVE frittatas sooo much! Such a perfect summertime dinner! This sounds amazing. YUM! I have never heard of sweet potato greens before! I don’t think we’ll be able to find them around here though. Going to try out almond milk (normally we have soya) – my boyfriend is now lactose intolerant although we discovered parmagiano reggiano is actually lactose free naturally. 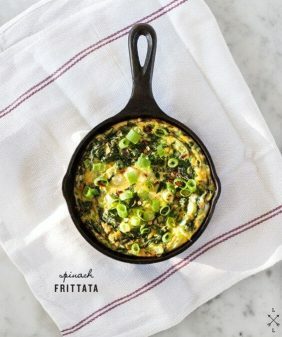 I’m mad for frittata’s , it’s a great way to get loads of veggies in. that’s true, many hard cheeses and sharp cheeses don’t have lactose. Milk and cream are the things I avoid most (although I also just don’t like the taste of milk). This looks so good! 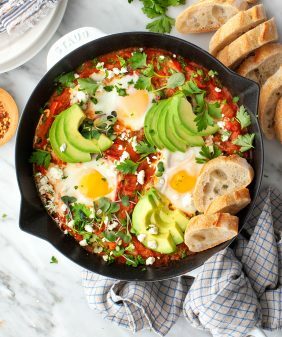 Perfect brunch recipe! This is such a gorgeous dish. I bet it tastes delicious! I love frittatas! I have never heard of sweet potato greens, but I am going to keep my eye out for them the next time I go to the farmer’s market. or throw an old sweet potato in a pot and have them handy and fresh! Great tip about substituting in almond milk. I love how colorful your one is and frittatas are perfect for during the week! Woah! I did not know you could eat sweet potato tops….neat. I’ve never seen them sold at the market, but will have to seek out a gardener. Perfect summer dish! they’re delicious! They just came in my csa box (I occasionally see them at my farmers market). I like it as well, so easy and always good. Lovely additions. This reminds me of this amazing brunch dish I had, it was a yellow squash and zucchini panade, with cheese and bread. It was baked in the oven until piping hot and crusty, so delicious! never heard of sweet potato greens, very cool. My eyes!!! I’ve never seen a prettier frittata, Jeanine! I’ve also never seen sweet potato greens but I’ll keep an eye out for them! Thsi looks absolutely delicious! 🙂 Beautiful, too! If I added any cheese would I just top it on there during the last few minutes of cooking? This looks lovely! Hi Anna, I add cheese at the beginning after I’ve layered everything in (right after the tomatoes). Cheese can cook the whole time. If you’re using fresh herbs, the only reason I add them near the end is because they’ll burn. looks great!! Just made it with goat cheese, pepperoni, tomatoes, scallions, green peppers & cilantro. sounds good, glad you liked! Yum, made it this morning & it was a huge hit! Delicious. Would this work with hemp milk? My daughter is cmpa and I’m learning lots of new recipes she is 9months old and we are doing blw. I can’t give her almond milk due to alligies. Do you know the nutritional info? Meetings must serve a purpose. Too often people set up reoccurring meetings without a clearly defined purpose.So click this link and get a more profit daily! 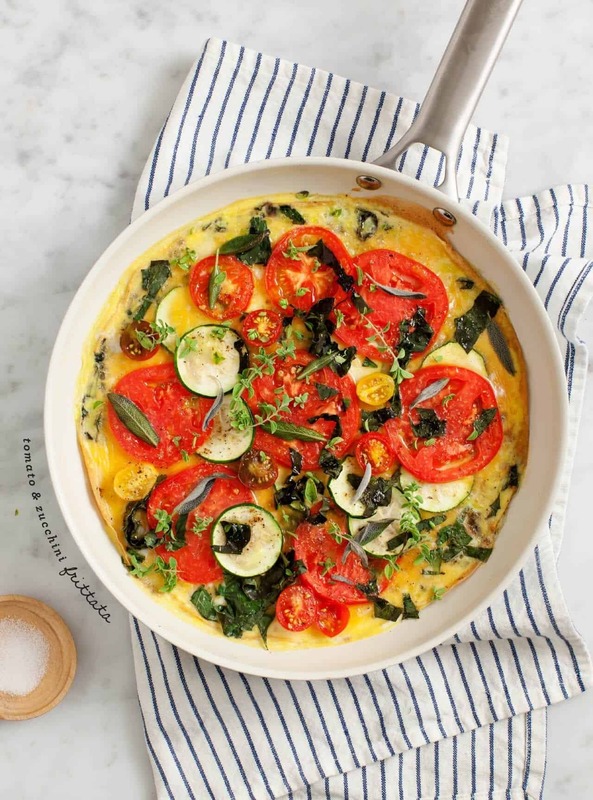 I love your recipe for the tomato zucchini frittata! It looks just mouthwatering! I’m putting together a recipe roundup and would like to feature your recipe link with the image. We will not repost the recipe and will also link the image to your site as well. Please let me know if this is ok- thanks! Do you know the calories of this recipe? Has anyone made this a day ahead? I’m not from Loveandlemons! I put the wrong info in the wrong place!